I will be using the definition of adventure rather liberally; using it figuratively and will definitely be using it as a verb! It’s far more action oriented that way. NOUN: an unusual and exciting, typically hazardous, experience or activity. VERB: engage in hazardous and exciting activity, especially the exploration of unknown territory. It seems that being an experiential learner, having a fundamental belief invaluable skills are learned on adventures, and knowing that with a new year there will be great opportunity, has me thinking of adventures lately — and if you have gotten this far, it has you reading. It’s easy to think of adventure as travelling to a new country, climbing a cliff face or trekking the highlands of Scotland — and although adventurous, it is limiting when you consider the full scope of what an adventure can be. 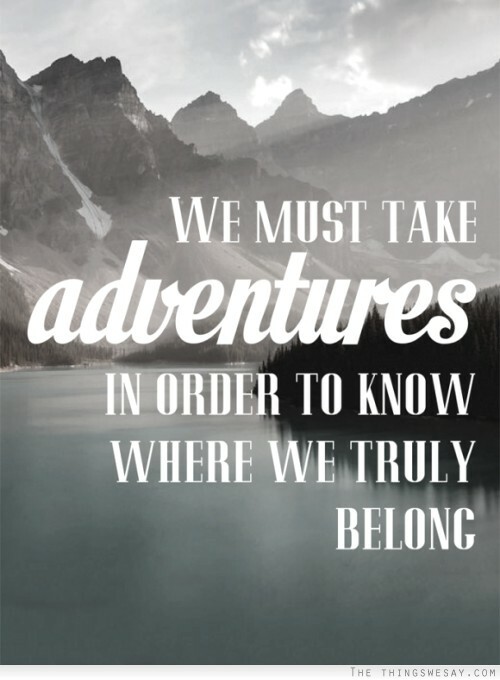 This is why I like thinking of adventure as a verb; especially when you think of it as exploration of unknown territory. Only know one language and it’s holding you back — learn a second language. It’s an adventure! Not very good with your hands — break out the tools and build that bunkie* you need. It’s an adventure! Someone is looking for a volunteer to solve a problem — raise your hand and say you will solve it. It’s an adventure! Instead of saying you can’t drive standard — ask someone to teach you. It’s an adventure. And although the big adventures are great to share with friends, I’ve found the real opportunity to grow and explore is with those small potential adventures that come your way on a daily basis. I’m a big believer in taking on these small adventures as a way to broaden your abilities, increase your view on the world, and simply become more interesting. Here’s to adventures both big and small !! And if you are wondering about any adventures I have on the list this year, my daughter and I are going to build a small off-grid bunkie with all the modern conveniences we can muster — talk about exploring unknown territory.